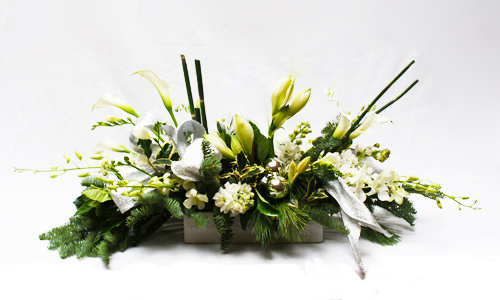 This elegant and artful centerpiece is loaded with wonderful scents and beautiful floral. It's sure to catch some attention on your Holiday table or spruce up your office with Seasonal Cheer! Approximately 30"-36" in total length and 12"-15" in total height. Thank you so much for doing such a wonderful job with the Valentine's bouquet for my mother. It arrived on schedule and she absolutely loves it! I always know I can rely on you for the most beautiful arrangements. Thanks again!